Ash Wednesday is always the first Wednesday of the Lenten season and marks the beginning of Lent. It is a season of penance, reflection, and fasting which prepares us for Christ's Resurrection on Easter Sunday, through which we attain redemption. The atmosphere in the Church is quiet and the observance solemn. People reflect on how quickly human life can pass. All are reminded of the need for repentance. Our foreheads are marked with ashes to humble our hearts and reminds us that life passes away on Earth. We remember this when we are told "Remember, Man is dust, and unto dust you shall return." Baptized individuals who have reached the age of reason. Babies and young children who have not yet received the Sacrament of Penance should not be presented to receive ashes since ashes are intended for those who are capable of personal sin. The observance of Ash Wednesday is intended to lead the baptized members of the Church to repentance and renewal of baptismal promises at Easter. The readings for Ash Wednesday offer a number of important images that help children understand the meaning of this experience. The first reading calls us to repentance but also emphasizes the God is gracious and merciful, slow to anger, and rich in kindness (Joel 2:13). In the second reading, Paul reminds us that the world sees the presence of Christ in the way we act. So, be reconciled to God today (2 Corinthians 5:20-6:1). We are called to be the love and change we wish to see in the world. In the third reading, Jesus reminds us that the sacrifices and prayers called for in Lent are between God and us. It is insincere for us to show off contrite actions to win the praise of others - let others only see how our sacrifices and prayers help us love them (Matthew 6:1-6, 16-18). The distribution of ashes comes from a ceremony of ages past. Christians who had committed grave faults performed public penance. On Ash Wednesday, the Bishop blessed the hair shirts which they were to wear during the forty days of penance, and sprinkled over them ashes made from the palms from the previous year. Then, while the faithful recited the Seven Penitential Psalms, the penitents were turned out of the church because of their sins - just as Adam, the first man, was turned out of Paradise because of his disobedience. The penitents did not enter the church again until Maundy Thursday after having won reconciliation by the toil of forty days' penance and sacramental absolution. Later, all Christians, whether public or secret penitents, came to receive ashes out of devotion. In earlier times, the distribution of ashes was followed by a penitential procession. Holy days of obligation are either commemorations of particular events (e.g., the birth of Christ or the presentation of Jesus in the Temple), particular people (such as Jesus' earthly father, St. Joseph), or important theological concepts (such as the Kingship of Christ). Ash Wednesday does not commemorate of these; indirectly it commemorates Christ since it is the beginning of preparation for the greater celebrations of Christ's saving work. 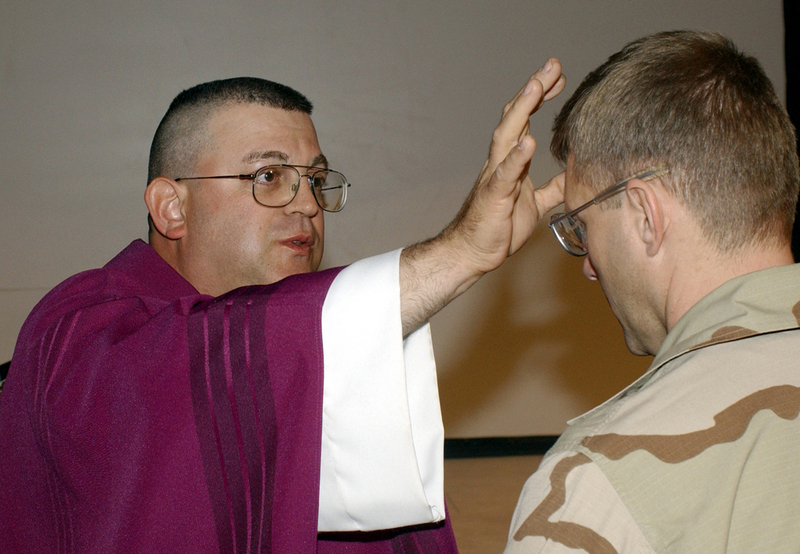 Although Ash Wednesday is a day of penance (like all of the days of Lent except Sundays, which are feast days no matter when they occur in the liturgical calendar since they celebrate Christ's resurrection), the Church has never chosen to make it or any other specific day the definitive commemoration of the concept of repentance.